Summer Science Activity for Kids: Backyard Dinosaur Excavation! Summer Science Activity for Kids: How to Create a Backyard Dinosaur Excavation! Take a look at this fun summer science activity for kids and create your own backyard dinosaur excavation! Post includes affiliate links. Dinosaurs have always caused fascination in children. They are so mesmerized by their size and strength, their various colors and their sharp claws. You may have a child who loves combing through dinosaur books, watching dinosaur movies, and learning everything they can about these ancient creatures. 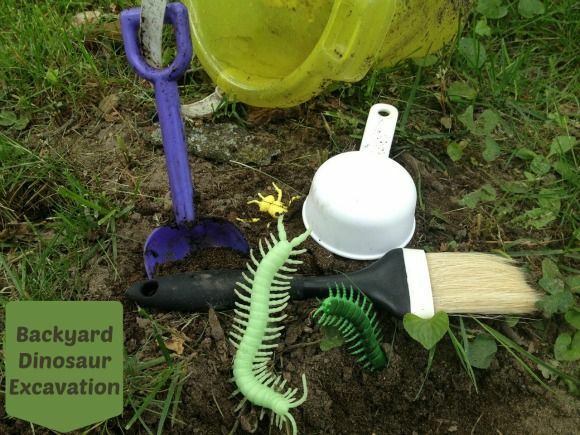 If this all sounds familiar, why not create a backyard dinosaur excavation for your child to enjoy? This fun summer science activity for kids is a cinch, and it will give them a chance to feel like legit backyard scientists. Gathering your supplies is easy, and you may already have a great deal of these items around your home. In no time and with very little investment, your child can be digging for dinosaurs just like a archeologist. Take a peek below at how easy it is to create a backyard dinosaur excavation. Before you begin, introduce some of the new words to your children that they will be hearing. For example, talk to them about acting as “archeologists” and how they will be “excavating” for “artifacts.” Explain these fancy and fun science words to them so they can become familiar with them and use them on their own. Next, it is time to gather the supplies for this summer science activity for kids. If you already have a backyard sand pit or box that is ideal, but if not you can easily substitute with a large bin and sand from a home improvement store. Plastic dinosaurs, assorted sizes and varieties. First, stir up your sandbox sand to soften it, or if using a plastic bin fill it up with your bagged sand. If using a plastic bin, you want to fill it about 2/3 of the way full since you want room to put all of your artifacts in. Now, bury the plastic dinosaurs and dinosaur eggs deep into the sand. Give children the tools such as a spoon, small shovel, and the pastry brush to start digging and exploring in the box. Show them how to use their brush and remove the dust from their found artifacts. Encourage them to dive in, get dirty, and dig up some dinosaurs. While the concept seems simple, this summer science activity for kids is a perfect example of a sensory box. A sensory box is a hands on activity educators have used for years to help children explore, strengthen, and develop early developmental skills. Children will love digging in the box, uncovering the old and ancient objects, and feeling the sand on their hands. When they have found all of the items, they can be encouraged to bury them again and start all over. A backyard dinosaur excavation is the perfect and unique way to let them enjoy a hands on experience while learning science at the same time. Continue to keep an open conversation with them as they dive in. They might have questions about what they find and you are the perfect person to ask! Review the words you discussed earlier, and ask them how they enjoying being an archeologist! To keep the mess a minimum, you can do this summer science activity for kids outside in your sandbox of course, or outside on a plastic tablecloth. You can also do it on a tablecloth indoors. That way, clean up is easy should sand get all over. You can add water if you wish for some extra texture, or other tools such as measuring cups to keep little hands busy. All of these tools as well as the ones listed in the supplies list encourage fine motor skills in a way that is enjoyable and fun. When finished, you can save all of the supplies and do this experiment again and again. Children will never get tired playing the role of archeologist and digging in the sand for their dino friends! Gather your supplies and give a backyard excavation a try! Want to check out another awesome summer science activity for kids that you can do in the backyard? Take a peek at our Seedling Experiment! What a great idea. I don’t know a kid that doesn’t love to dig and play in the dirt or sand! Would be fun as a treasure hunt too! Thanks, Robin! It is tons of fun and a treasure hunt is a great idea! Thank you, Kathe! So glad you enjoyed it! We are so excited that you have chosen to feature and pin it! What a fantastic idea – and we love dinosaurs – have pinned it. What a fun and educational idea to ease kids back into learning as summer winds down. Thanks for sharing on BeColorful. I bet your kids had a blast! I know I would have – lol! Shannon (The Mommy-Files) recently posted..Wordless Wednesday – End of Summer Family Fun at Disney!